NO THEY DONT. THEY DONT MAKE THEM WITH FOUR BANGERS THEY MADE THE WITH FOUR BANGERS. THE 05 MUSTANG HAS NO 4 cyl. nor the 04 or 03 or 02 or 01. A four banger mustang hasn't been out since the SVO. ARE YOU STUPID? Like the one Frankie beat with a '03ish auto Accord. The very first Mustangs had inline six cyl engines. (in fact, the original concept for the Mustang was a mid engine V4 sports car) The V8 wasn't added to the range for a few months after production started. It wasnt' supposed to be a muscle car, simply a sporty coupe. That's been it's success: having an econimical sporty coupe in teh lineup, as well as teh muscular performer. In fact, adding the 4 cyl version in '74 was one of the things that kept the car alive. GM did the same with the Camaro in '82. Gives a sporty, low insurance platform that isn't a basic economy car. Funny, anyone else makes a V6, RWD 2+2 sport coupe, and everyone is all over it as a great sports car. Ford does it with their sport coupe and it's insulted because there's a V8 version in the lineup. Any other sub $20k RWD V6 sport coupes on the market? Any other 215 hp RWD sport coupes under $20k on the market? Well that's only true because of the "energy crisis". I guess that Ford kept them in there because they went slack(like many automakers) after the energy crisis. Maybe they thought they could just give 50% becuase their 50% then was better than what they could do during the "energy crisis", but I wasn't even a thought in my parent's mind then, so what do I know? This is what i think of kia's. Actually, it's a common misconception that the Mustang II was introduced 9and had a 4 cyl) due to the energy crisis. 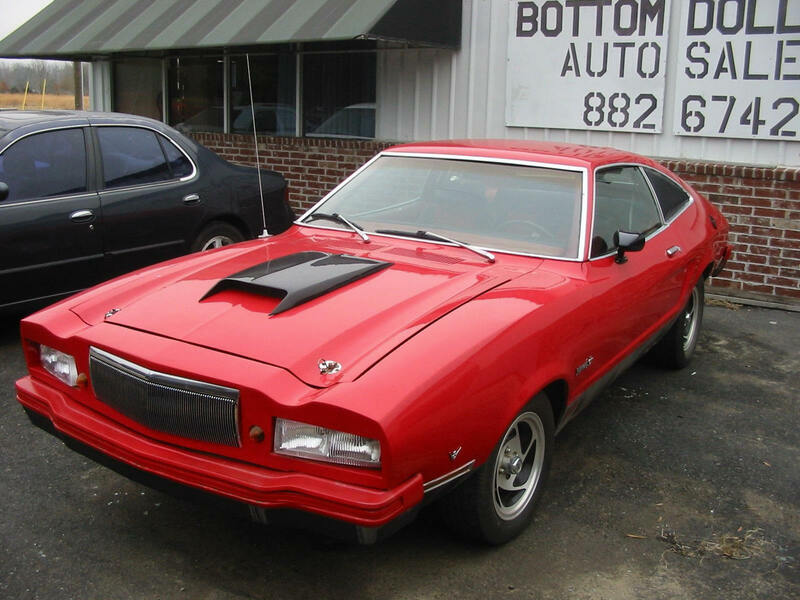 In fact, it first hit dealerships in late '73 as a '74 model, just as teh energy crisis was starting to hit. But in order to do that, the tooling had to be finalized and created in '72 to get teh production line ready by mid '73 to start them rolling off th eassembly line. And in order to do that, the design had to be finalized by early '72. And in fact, design of the Mustang II was started in 1970, while the BOSS 302s and BOSS 429s were rolling through dealer showrooms! The Mustang II was actually Ford trying to get the Mustang back to it's roots as an economical small sporty car, as it had grown much larger over the years. And truth be known, the insurance for the musclecars had gotten outrageous and was what really killed them off The 4 cyl 2.3 liter in the '74 Mustang II was actually as powerful as the 2.8 liter I6 in the '64 Mustang... by making the car a 4 cyl model to start with, Ford was able to make an end run around increasing insurance rates and made teh car affordable to everyone again. Of course, they added a V6 and V8 the following year, and while teh V8 was severely strangled in output for emisions and insurance reasons, it weas still a 302, which meant it had HUGE aftermarket potential. But the fact that 4 cyl ones were made was advantageous for the car, and is the reason a small engine model will always be available in the Mustang line, keeping it alive for the performance versions. I actually like the Mustang II's and King Cobras ('77 or '78), even without great performance they are nice looking cars. Man, i love what photoshop can do. That convertible pic is sweet. I was actually thinking of buying a Mustang II kinda like the first one you posted (same colours), i know where it is just never asked about it, mind changes about cars i want all the time. Last edited by car_crazy89 : 07-15-2005 at 09:28 PM. I noticed some of that. I think you could make a good car designer, or maybe even just a custom car designer. Hard to believe how just a few changes in a pic can make that much of a difference (lose the top, add a spoiler and better wheels/tires and change grille).